If a Land Cruiser could be fashioned from the earth and forged in steel, this is what it would look like. Its iconic shape preserved in a color that feels right at home on our client’s ranch outside of Kansas City. Undeniably rugged and unexpectedly comfortable, this backcountry warrior is ready for adventure. 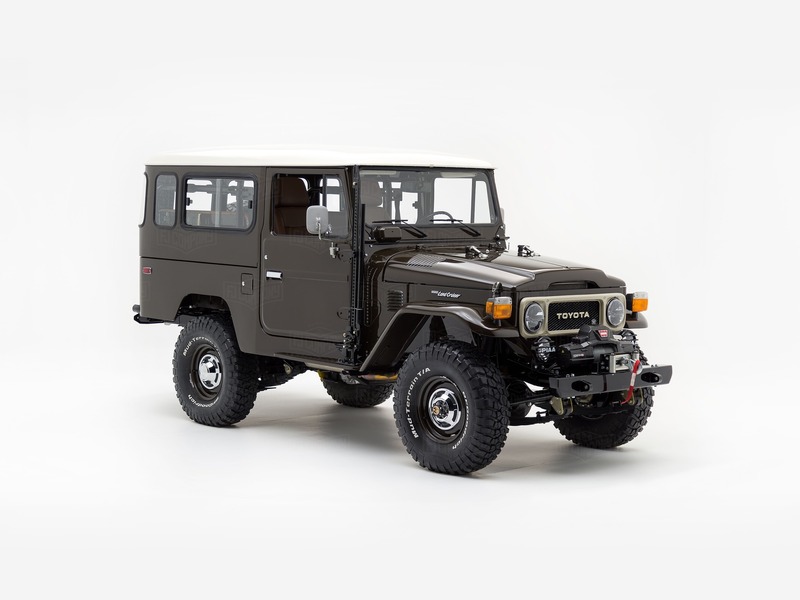 This FJ43’s beautifully bolted exterior makes no apologies for its abundance of rough edges and old-school charm. This is, after all, the Land Cruiser look. And here, it makes a bold statement with Buffalo Brown paint, big tires, and plenty of off-road gadgetry. The Toyota 1FZ has that die-hard, heavy-duty construction that the old-school Toyota engines are known for. But here, Toyota’s trusty inline 6 is electronically injected and mated to a five-speed transmission for better all-around performance. Front and rear disc brakes ensure you’ll stop on a dime, while added steering stability and modern leaf-spring suspension further refine the ride. Behind the wheel, it’s tempting to lose yourself in the craftsmanship of the past. But here, retro design begets modern functionality. This cabin may have retro gauges and controls, but luxuries like heated seats, the perfect temperature, and Bluetooth are always just a touch away. There’s even a rear backup camera standing by for guidance. With a 1GR-FE engine and other modern upgrades, the G40 Expedition by The FJ Company is the perfect companion on a backcountry adventure. Customize yours!